When my computer was on the fritz in December, I took advantage of holiday sales and got a new one. It was definitely bad timing finance wise, but I needed a functioning computer. My car died in January. It was a long time coming, so I wasn't shocked. Luckily, I was able to get a new car. Around the same time, my very old TV died. Again, not a shock, but still. Really? A new TV would have to wait. It was definitely not a priority, especially considering recent expenses. After about a week without a TV, I learned about Aereo. To put this in a bit more perspective, I haven't had cable for about 12 years. At my old apartment I had it, but was never too thrilled with the programming. The price kept going up and I didn't watch it much. But I still paid. When I moved to where I am now, Comcast wanted me to pay a new installation fee on top of the constantly rising monthly charge. That was the last straw. I refused to pay it and cut cable. I haven't missed cable at all. I watch DVDs and can see a lot online. After seeing so much talk on Twitter, I broke down and got Netflix for House of Cards right after Season 2 was released. G and I binge-watched both seasons in a little over a week. It's the most addictive show ever!! I cannot wait for Season 3 which starts in February! Actually I can wait, because I don't want to wish the summer away. But, I digress. So anyway, I don't have cable, Netflix is great, but my TV was dead. At the time, Aereo was offering a free month of their service in the Boston area. Basically, Aereo allowed you watch network TV on your computer. Plus, you can could DVR shows, pause, rewind, and fast forward. Instead of shelling out a few hundred dollars on a new TV, I decided to try Aereo. I loved it! A friend of mine randomly happened to have a new extra TV, so she gave me hers and I ended up not needing to buy one. But I kept Aereo. The monthly fee was small. Since I didn't have cable, I liked being able to DVR and it was like having a second TV. Then I started reading that there were lawsuits against Aero by broadcast TV. Broadcasters did not like Aereo's business model and considered it copyright infringement. Just this week, the U.S. Supreme Court decided one of the cases and ruled against Aero. The photo above is a screen shot of the Aereo website. 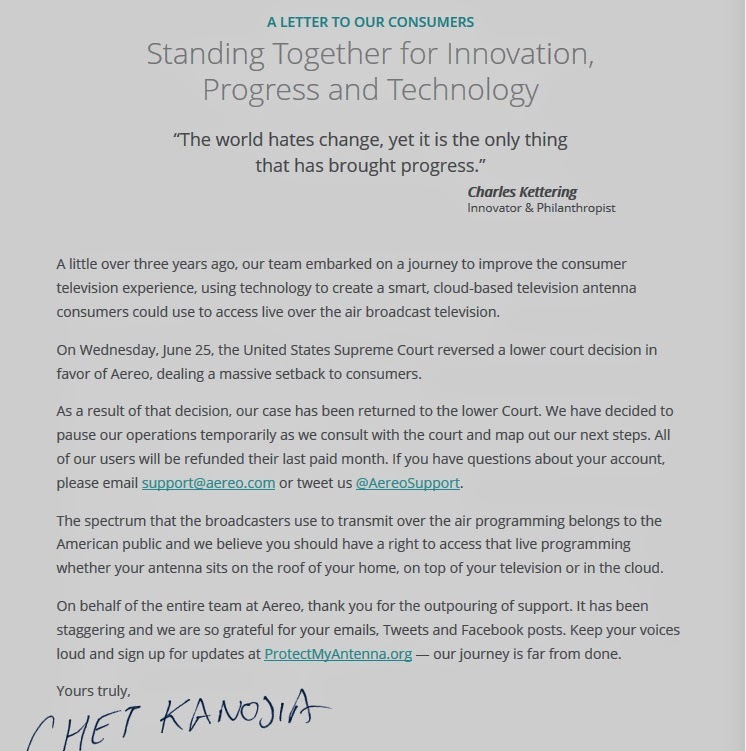 This morning, I received an email from Aereo which has the same content as the letter on the website. Below is an excerpt. A little over three years ago, our team embarked on a journey to improve the consumer television experience, using technology to create a smart, cloud-based television antenna consumers could use to access live over the air broadcast television. On Wednesday, the United States Supreme Court reversed a lower court decision in favor of Aereo, dealing a massive setback to consumers. As a result of that decision, our case has been returned to the lower Court. We have decided to pause our operations temporarily as we consult with the court and map out our next steps. You will be able to access your cloud-based antenna and DVR only until 11:30 a.m. ET today. All of our users will be refunded their last paid month. If you have questions about your account, please email support@aereo.com or tweet us @AereoSupport. The spectrum that the broadcasters use to transmit over the air programming belongs to the American public and we believe you should have a right to access that live programming whether your antenna sits on the roof of your home, on top of your television or in the cloud. I haven't read through the decision yet, but do plan on it. I only had the service for a few months and really enjoyed it. It filled a gap between network TV and having cable. Now I cannot DVR and will miss that ability. I will never go back to cable though. It will be interesting to see how this decision impacts the future of online viewing and copyright cases to come. Our viewing habits have changed because 30 years ago the Supreme Court ruled that it was not illegal for consumers to use a VCR to tape television shows to watch at a later time. We are used to being able to watch what we want, when we want. Below is a slightly edited portion of that decision from decades ago. Sony demonstrated a significant likelihood that substantial numbers of copyright holders who license their works for broadcast on free television would not object to having their broadcasts time-shifted by private viewers. One may search the Copyright Act in vain for any sign that the elected representatives of the millions of people who watch television every day have made it unlawful to copy a program for later viewing at home, or have enacted a flat prohibition against the sale of machines that make such copying possible. It may well be that Congress will take a fresh look at this new technology, just as it so often has examined other innovations in the past. But it is not our job to apply laws that have not yet been written. It seems that we the viewing audience are at a similar point again. But this time, the ruling went in the other direction and against the consumer. New technology and innovation have changed our expectations about so much in the world, including how we obtain our viewing entertainment. Now the law needs to keep up.